I expect there will be tears shed and smiles made, I know that I've been moved by the stories I've heard and the veterans I've met. But, Operation Welcome Home is not intended to dwell only on the past. It will be a day of education, information and celebration. The Veterans War Memorial located just east of the McAllen Convention Center will kick off the day-long event at 10:30 a.m. with a dedication ceremony of a new memorial installment. At 1:00 p.m., a series of workshops and information booths begin and are presented by veterans’ organizations or agencies; and a memory room is available for veterans who want to display photos, medals or other memorabilia. In the main hall, a locally-produced play, “Pat & Lyndon”, will perform followed by the Corpus Christ Veterans Band. Outside, a large map of South Vietnam showing areas of operations and major battles is on display as well as a military vehicle exhibit from the era. 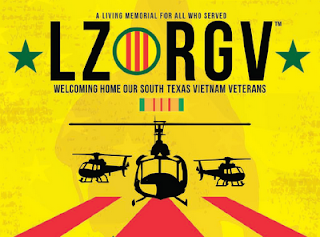 LZ:RGV - Operation Welcome Home finale begins at 6:00 p.m. in the main hall. The program will include Retired Lt. General Ricardo Sanchez, guest speakers, live entertainment and music from the Vietnam War era performed by major concert headliners. Videos featuring veterans and others will be representative of the South Texas Vietnam War experience and are sponsored by H-E-B. Other major sponsors are: Entravision Communications; Linebarger Goggan; L&F Distributors-Budweiser; IBC Bank, the del Rio Group, Carrera Communications, Joseph Palacios Family of Edinburg, Mayor Richard Cortez and the City of McAllen.